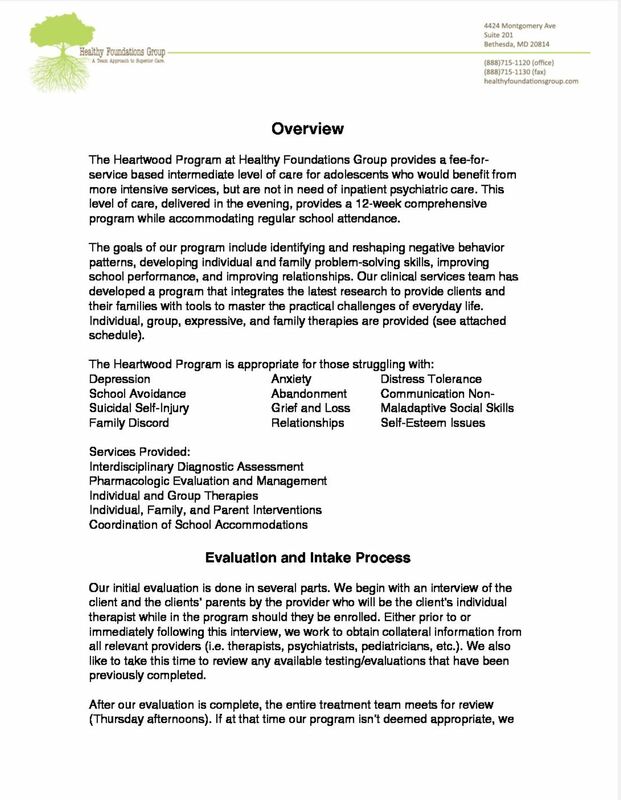 Healthy Foundations Group provides an intermediate level of care for adolescents who would benefit from more intensive services, but are not in need of inpatient psychiatric care. This level of care, delivered in the evening, provides a 12 (+) week comprehensive program while accommodating regular school attendance. Following an interdisciplinary diagnostic evaluation, an individualized treatment plan is developed with the adolescent and his or her family. The goals of our program include identifying and reshaping negative behavior patterns, developing individual and family problem-solving skills, improving school performance, and improving relationships. Our clinical services team has developed a program that integrates the latest research to provide clients and their families with tools to master the practical challenges of everyday life. Indivudal, group, expressive, and family therapies are provided. Have questions or to request an an intake: Service Requests or call us at 1-888-715-1120.